When you register at HomesForHeroes.com, we’ll match you with a real estate specialist in your area who can help you find your new dream home. All of our partners are dedicated to helping healthcare professionals achieve their goals, and they’ll work with you throughout the home buying process. Whether you want to live close to work or prefer a quiet place away from the sounds of ambulance sirens, they’ll help you find exactly what you want. Despite everything you do for our community, it can still be difficult for some healthcare professionals to get a home mortgage loan. This is especially true for traveling nurses who switch jobs frequently. But when you work with Homes for Heroes you’ll be matched with a mortgage specialist to assist with your home financing, who can take you through the loan process, and get you the terms that work for your budget and lifestyle. When you have your financing in place and have found your dream home, there are still a number of steps before you can move in. Negotiations, title and home inspections are important to-dos and can quickly get complicated. Our real estate, title and home inspector specialists will help navigate these processes, iron out the details, and make sure all the I’s are dotted and the T’s are crossed so you can feel confident everything is handled correctly. All that’s left to do is sign on the bottom line. After you close, Homes for Heroes will mail you a check for 0.7 percent of the purchase price. On average, our heroes save around $2,400 when they work with our local real estate, mortgage, title and home inspector specialists who are all committed to maximizing your savings and delivering a top-notch home buying experience. When you’re ready to move into your new home, our local deals offer savings with select moving companies and other home service providers. If there’s one thing we do well, it’s helping healthcare professionals save money. Throughout every step of the process, Homes for Heroes looks for ways to save you money. Whether it’s saving on commissions, fees, closing costs or home inspections, we want to keep your money where it belongs — in your pocket. Simply by working with us to fulfill your homeownership dreams, you also assist your fellow American heroes. Every time you buy (or sell) a home using the services provided by Homes for Heroes, Inc. we make a donation to the Homes for Heroes Foundation. The Homes for Heroes Foundation awards Hero Grants to local nonprofit charities who assist community heroes in need of housing or emergency financial assistance. Are you a healthcare professional looking to make a move? 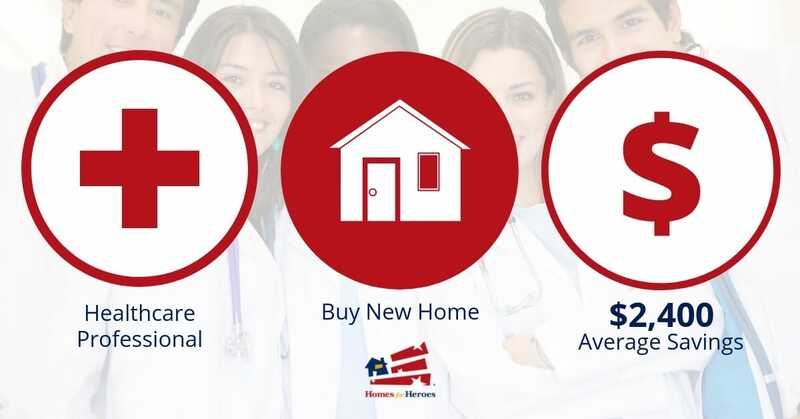 Register with Homes for Heroes and let us save you significant money on your next home purchase.